What is a Western Subterranean Termite? Termites are a home’s worst enemy, as any Portland Pest Guard specialist can attest. One of the most prevalent and destructive species of termite in the Pacific Northwest is the Western subterranean termite, particularly in urban areas. Western subterranean termites love to eat Douglas fir and similar types of lumber used for the construction of buildings. They eat the internal sections of timber, preferring the spring wood, and leave the summer wood sections of lumber behind. The result is thin, hollowed-out sections of wood that resemble a honeycomb. Because of the destructive and vindictive nature of these pests, it’s best to leave termite pest control to the pros. Western subterranean termites are secretive and rely on stealth to enter buildings through unrepaired or unnoticed cracks as small as a 1/8 inch in walls, patios, concrete slab, expansion joints, fire hearths and so on. In addition to wood, these termites can eat through the rubber compound in concrete, and they can travel under tough types of flooring in order to get to the timber in a building. 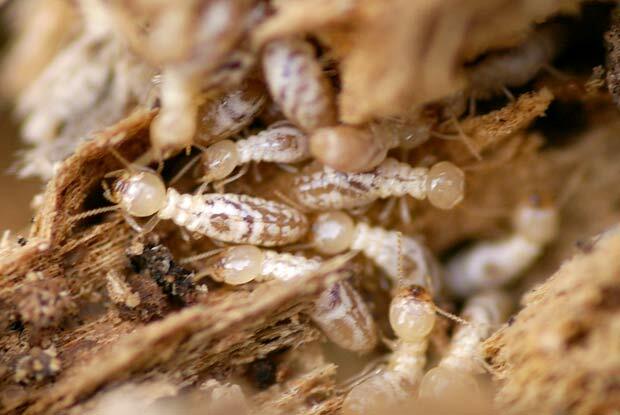 Because these wood eaters are so stealthy, many homeowners do not realize they have a termite pest control problem until the infestation is well-established. These pesky termites have a well-ordered social system, as well as acute survival instincts that allow them to communicate with pheromone signals. If you discover the insects and attempt to practice termite pest control on your own, the disturbance may prompt the pests to secretly cause new damage to different areas of the building as a form of revenge. call a Portland Pest Guard specialist ASAP. Give us a call today at 503.720.8559 to learn more about Western Subterranean Termites or to schedule an inspection!